← Fight the Right Fight! If you’re doing one of those read the Bible through in a year and you started in Genesis then you probably recently read or are now reading in Leviticus. We tend to scan through this book. I was determined to read it slowly and carefully to let God show me or teach me something. It didn’t take long. The first few chapters showed me something. Notice that in the first 3 chapters whenever a person was bringing a sacrifice, they had to kill it! The person would bring it to the gate or before the altar, lay their hands on its head to transfer sin to the animal and then kill it themselves, cut it into pieces and take out the insides. Then the Priests would offer the offering. Wow. I kept thinking about the mess. I wouldn’t want to wear my nice clothes when I went to worship because I wouldn’t want to get blood all over them. Then I began to think of the whole place. Death, blood, fire and ashes everywhere. Blood sprinkled on everything. Pools of blood where the animals were killed. Have you ever been to a slaughter house? Have you ever smelled dried blood? This isn’t the picture of worship that I usually have in mind. Then I began to think. I had to kill it. Me! I love animals. It would be me who straddled the young goat or lamb. It would be my hand that lifted his chin and my hand that yielded the knife across his throat. It would be me that the blood would spray on. My feet. My clothes. My hands. I wondered how I would be affected after that event. Would the blood stains on my hands and feet stay for a few days? Would my clothes ever be stain free or would the stain be a constant reminder? Would I feel the young animal go limp in my arms for days? Would I still; days later, feel him struggling to get away from me as I held him tight and slid the blade across his throat? Would I have a greater picture of the seriousness of my sin? Would I have a better understanding of the innocent dying for the guilty as I remember the look in the guiltless eyes? Would there be a seriousness the next time I went to worship? I remember years ago as the movie The Passion of The Christ was coming out that I watched an interview that Dianne Sawyer did with Mel Gibson. She was pushing him with the question of who killed Jesus. She wanted him to say the Jews did it so the anti-Semitic view could come out. Finally he admitted that the Jews and Romans were the human agents through whom God would bring about the death of His Son, but, he said, ”I killed Jesus.” And there it is. I killed Him! I killed the Lamb of God. I drove the nails. I thrust the spear. I swung the whip. My hands are stained with His blood. It was me! I need to remember that as go to worship and as I leave worship. I need a blood stain on my clothes. Maybe we shouldn’t wear our good clothes to worship. Okay. No. By the end of the book, my Caleb was bawling. It was the Passover. Israelites preparing to leave Egypt. 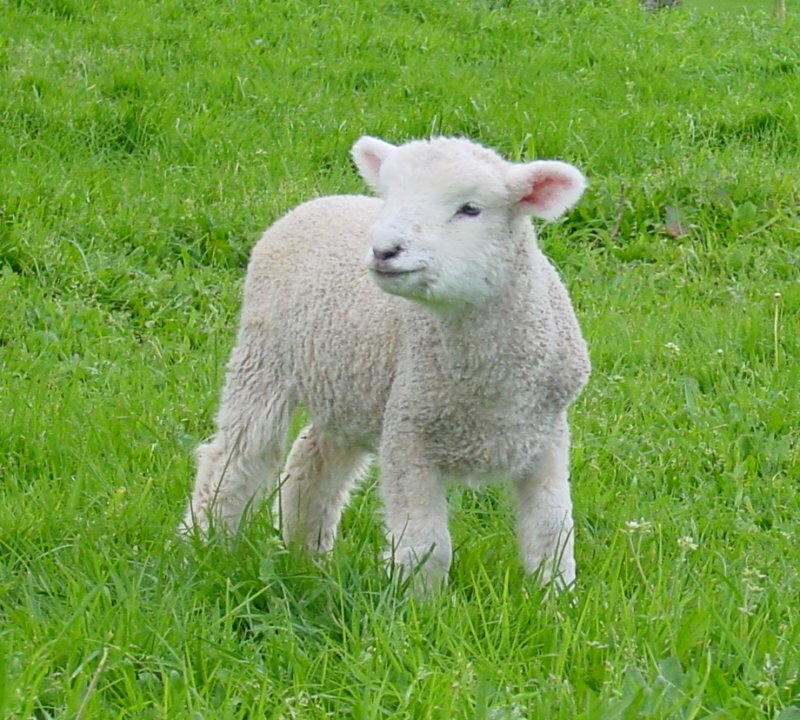 And Caleb’s lamb, perfect innocent lamb, is chosen as his family’s sacrifice. I’d never put myself in their shoes that way until I read that book. I’d never seen sin from that point of view. The sin that caused death. The sin that needed death. I wish that image would burn into my mind so I’d more readily guard my heart and mind each day. I’ve been beset with the very same concepts in my head the last two days, and I’ve the “bones” sketched out for a blog of my own on the topic … maybe by tomorrow. I’ll be looking forward to reading it Randy. Cristal, you should never have gotten away from Veggie Tales …..
Veggie Tales…I know. What was I thinking? I didn’t have the guts to watch The Passion of Christ, and I’m fairly certain scriptures emphasis is more on the separation from The Father than the acute physical pain which surely occurred BUT Mel Gibson is spot on. I killed Christ, you killed Christ, we’re ALL GUILTY, let’s not duck the issue. It might make us more grateful, help us appreciate Him all the more.